This is a great book about losing yourself in your imagination. A friend mentioned to me that this is a great companion or read-alike for WHERE THE WILD THINGS ARE. Both stories start in the bedroom and end in the bedroom. In between, the reader gets lost in an amazing adventure. DRAW! is set in Africa and follows a young artist as he draws his way across the country while he draws the beautiful animals that live there. 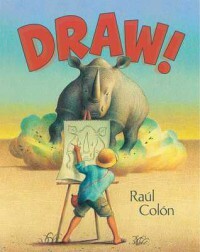 The Colon's illustrations are gorgeous - the use of texture, superb. This is definitely a book to add to your collection.